Chelsea will soon be cleared to complete the transfer of Gonzalo Higuain as Krzysztof Piatek is set for a medical at AC Milan. 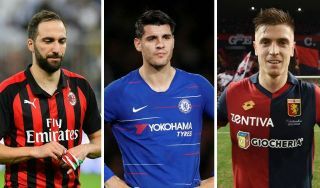 This update comes from Goal, with Piatek’s arrival at the San Siro set to be the next key piece in the puzzle to allow Higuain to make the move to Stamford Bridge. Piatek has been in impressively prolific form for Genoa since arriving in Serie A as a relative unknown this summer, and it’s quickly earned him a big move to Milan. The Poland international looks a fine potential replacement for Higuain, whose loan with the Rossoneri has not exactly panned out as expected. The 31-year-old joined Milan from Juventus in the summer but has not been at his best, though Chelsea are perhaps unsurprisingly prepared to gamble on him, desperate as they are for an upgrade on Alvaro Morata. Looks like today will be a busy day for Chelsea!